A person with a disability is much, much more than a handicap. A pediatrician is more than a medical doctor. You're much more than your job description or your age or your income or your output. Anything that's human is mentionable, and anything that is mentionable can be more manageable. Being able to resolve conflicts peacefully is one of the greatest strengths we can give our children. Discovering the truth about ourselves is a lifetime's work, but it's worth the effort. Forgiveness is a strange thing. It can sometimes be easier to forgive our enemies than our friends. It can be hardest of all to forgive people we love. I'm fairly convinced that the Kingdom of God is for the broken- hearted. You write of 'powerlessness.' Join the club, we are not in control. God is. Life is deep and simple, and what our society gives us is shallow and complicated. Little by little we human beings are confronted with situations that give us more and more clues that we are not perfect. Love and trust, in the space between what's said and what's heard in our life, can make all the difference in the world. Love is generally confused with dependence. Those of us who have grown in true love know that we can love only in proportion to our capacity for independence. Love is like infinity: You can't have more or less infinity, and you can't compare two things to see if they're 'equally infinite.' Infinity just is, and that's the way I think love is, too. Often out of periods of losing come the greatest strivings toward a new winning streak. Solitude is different from loneliness, and it doesn't have to be a lonely kind of thing. The connections we make in the course of a life- maybe that's what heaven is. Try your best to make goodness attractive. That's one of the toughest assignments you'll ever be given. We speak with more than our mouths. We listen with more than our ears. What matters in this life is more than winning for ourselves. What really matters is helping others win, too, even if it means slowing down and changing our course now and then. What's been important in my understanding of myself and others is the fact that each one of us is so much more than any one thing. A sick child is much more than his or her sickness. Who we are in the present includes who we were in the past. Who you are inside is what helps you make and do everything in life. You can't really love someone else unless you really love yourself first. 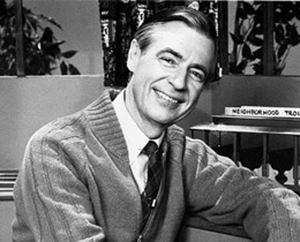 Fred Rogers earns PBS $20 million.